All employees who are involved in making improvements in their jobs and working on teams. DMAIC Problem-Solving (Define-Measure-Analyze-Improve-Control) is a step-by-step problem-solving methodology used by many Lean Six Sigma companies. With the DMAIC problem-solving process, teams address and solve problems by uncovering and eliminating the root cause of the problem through a structured series of steps using data collection and data analysis tools and techniques. DMAIC Basics online training consists of six lessons and a Challenge intended to allow learners to test their comprehension of the body of knowledge covered in the course. 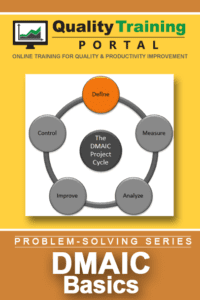 The course content begins with a short lesson introducing the five phases of the DMAIC project cycle. The five lessons that follow work through the Define, Measure, Analyze, Improve and Control phases sequentially. Work on and contribute to a project team using the DMAIC Methodology. Get to the root cause of problems using data and analysis and develop lasting solutions. Learners should have a specific team problem-solving project in mind to work on before taking this course. Five Why’s – Focused training in how to use the Five Why’s technique to get to the root cause of problems. Lesson 1 | What is 5S All About? An overview of the 5S’s. The benefits and operational impact of implementing the 5S’s. A stepwise approach to clear the work area. Considerations for establishing locations for storing items including: storage rationale, storage options, location-specific tips, storage don’ts, using signs and labels and documenting the plan. The three aspects of Shine: getting the workplace clean, maintaining its appearance, and using preventive measures to keep it clean. How to design systems that helps ensure that everyone does things the same way with full involvement, standardized training, and a “copy exactly” mindset. How to plan and implement a 5S initiative. An 8-point roadmap to implement the 5S’s: 1: Leadership Team; 2: Infrastructure; 3: Communications; 4: Training; 5: 5S Pilots; 6: Best Practices; 7: Full Roll-Out Plan; 8: Evaluate and Adjust. How to implement the 5S’s in a work area if an organization-wide initiative is not supported. Examples of “Sort Successes” showing both the before-state and the after-state with the impact (savings) explained. Checklist to help achieve successful Sorts. Examples of “Set in Order Successes” showing both the before-state and the after-state complete with the impact on the organization. Sort: Sort out items not needed in the work area and disposition those items to be removed. Set in Order: Select the best locations and ways to store items used in the work area using a structured rationale and knowledge of storage options. Shine: Get the workplace clean; then maintain the appearance of the workplace and institute preventive measures to ensure it stays clean. Standardize: Design systems in place to ensure everyone does things the same way, implement techniques to ingrain a “copy exactly” mind set, and leverage Best Practices. Sustain: Learn how to prevent backsliding and build the 5S’s into the culture of the organization. In this unit, learners explore approaches to implement the 5S’s in their organization (or work area); examples of successes for each 5S phase are included. Organization-Wide Implementation: Work though an 8-point checklist to plan an organization-wide implementation of the 5S’s. Work Area Implementation: Use a 6-point checklist to plan your work area 5S effort if a site-wide 5S implementation is not supported. Sort Successes: Explore examples of “Sort Successes” to trigger ideas for your 5S effort. Set in Order Successes: Use lessons learned from “Set in Order Successes” to fuel your 5S effort. Shine, Standardize, & Sustain Successes: Adopt the examples discussed to build success factors into your Shine, Standardize, and Sustain efforts. What is DMAIC and how does it compare to other problem-solving models? Establish a project (problem-solving) team and get the team started up. Set up measurement systems so that the appropriate data needed to determine the root cause of the problem can be collected. Assess measurement systems to make sure they are reliable. Use a systematic approach to collect, display, and analyze data to identify the root cause(s). Verify that the cause(s) identified is truly the root cause. Identify a solution to attack the root cause and correct the problem. Develop simple and complex action plans. Use Gantt Charts to plan the implementation and monitor progress. Ensure the solution is robust and well entrenched so that problem does not come back. Provide training and start audit practices to complete transfer of the solution to the process owners. Describe each of the steps of the DMAIC process. Learn how to use a structured process to solve problems. Work on a problem-solving team. Use data collection and analysis tools to find and solve problems. Ensure that solutions are robust, effective and continue to work.